39 people really didnt' see this coming? 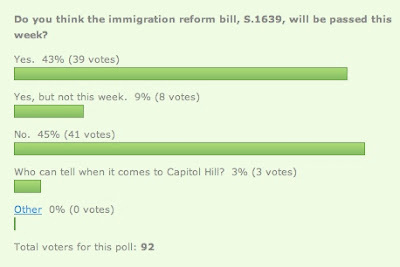 It seems the American people have spoken, and they are satisfied with the status quo. See you in 2009, when the problem is even larger and the people finally realize it will take reform in order to fix it. I thought my fellow Americans were smarter than this, but it appears news anchors (ie Lou Dobbs) are running our country. I totally agree with the last/above poster. We can't spend several more years not thinking about it and then more trying to appease partisan interests. The way immigration is dealt with now is not fit for the way immigration is in the present. We need to reform the laws to fit the present condition of immigration in our country. The American people are NOT satisfied with the "status quo." We want what we have wanted all along: closing of the border and enforcing of our existing immigration laws, as was promised to us in 1986 in exchange for that "one time only" amnesty.